Dolphins I and III from "Family of Dolphins" installed at the William Donald Schaefer Promenade Fountain at the National Aquarium in Baltimore. Issues I sought to highlight in this installation include the transformative potential of imagination in art as well as in addressing larger societal issues such as pollution, waste disposal, habitat destruction and quality of life. "Hybrid XII" sculpture created out of found materials. Since 1980, my work has focussed on imaginative transformation of the used-up, mass-produced junk in our increasingly polluted environment. 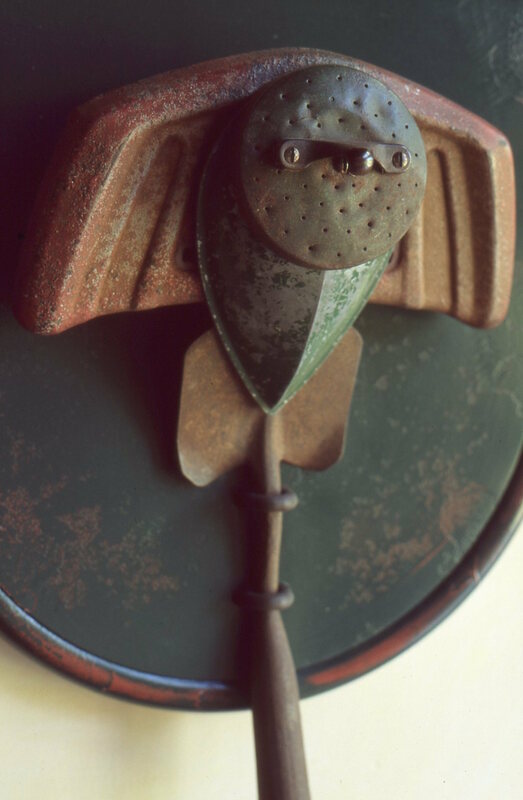 I explore how these cast-off products can be imaginatively recycled into objects of art. 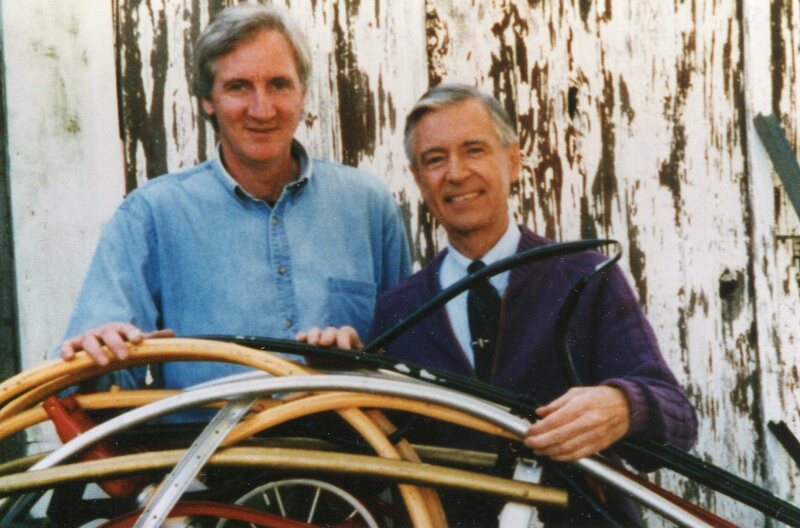 I was very honored to have the interest and support of Fred Rogers. He understood the danger of passivity as opposed to the active and imaginative engagement of children with their environment through the process of art-making. 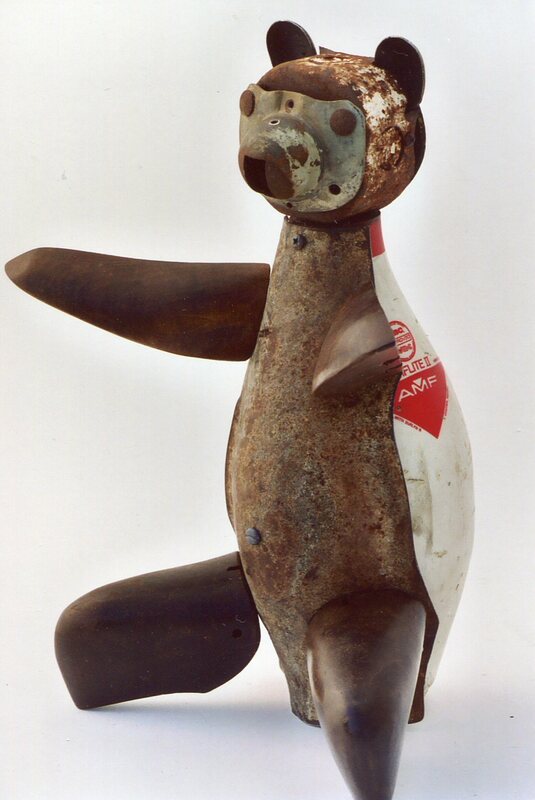 A sculpture of a "Dove" created out of found objects including a bowling pin. We are witnessing daily the accelerated degradation of the environment and species extinction due to human activity including the burning of fossil fuels and pollution. Art can sometimes inspire people to wake up. Leonard Streckfus studied art and art history at the University of Maryland (MA, 1978) and the Maryland Institute (MFA, 1980). His creative process involves the search for suggestive shapes among heaps of thrownaway objects which he "weaves" together to make poetic images of animals. My"Family of Wolves" sculpture is in the Lena Meijer Children's Garden of the Frederik Meijer Sculpture Park in Grand Rapids, Michigan. Wolves were historically present in all fifty states; today their numbers are much reduced. Near-extinction due to over-hunting and habitat destruction has been catastrophic to healthy ecological systems. I hope my "Family of Wolves" created out of thrownaway materials inspire a "connect-the-dots" among viewers. Three found object Wolf sculptures out of the total of five that comprise the "Family of Wolves" sculpture in the Lena Meijer Children's Garden of Frederik Meijer Gardens and Sculpture Park in Grand Rapids, Michigan. They are created out of discarded materials. Found object sculptures installed at the Frederik Meijer Gardens and Sculpture Park, Grand Rapids, Michigan. 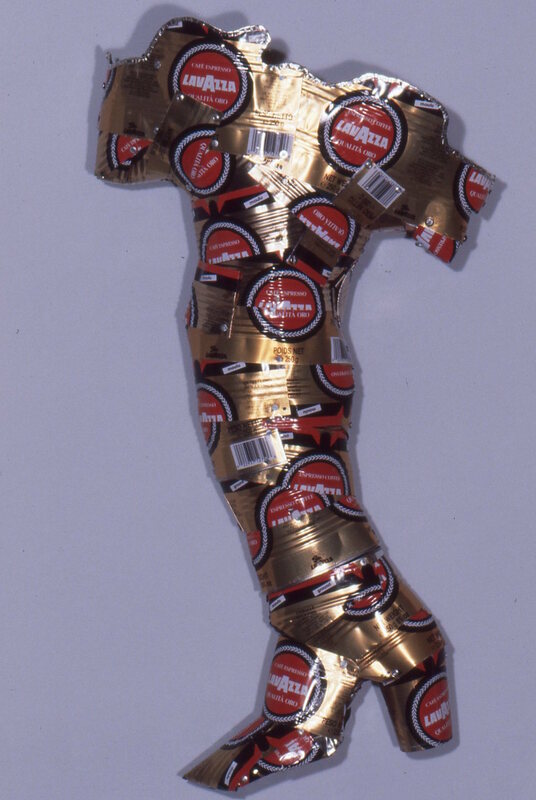 2003-2004; lifesize. 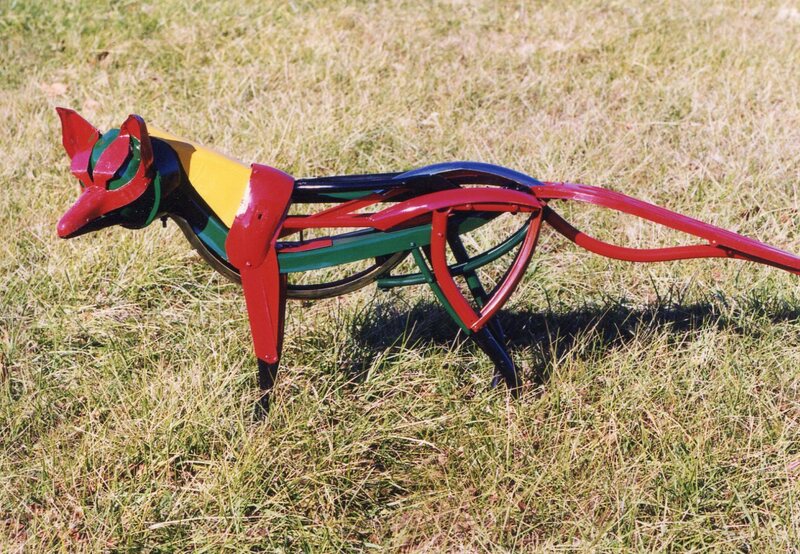 A found object sculpture of a Wolf, one of five that comprise the "Family of Wolves" sculpture at the Lena Meijer Children's Garden of Frederik Meijer Gardens and Sculpture Park in Grand Rapids, Michigan. Found object Wolf sculpture, one of five that comprise the "Family of Wolves" at the Lena Meijer Children's Garden of Frederik Meijer Gardens and Sculpture Park in Grand Rapids, Michigan. 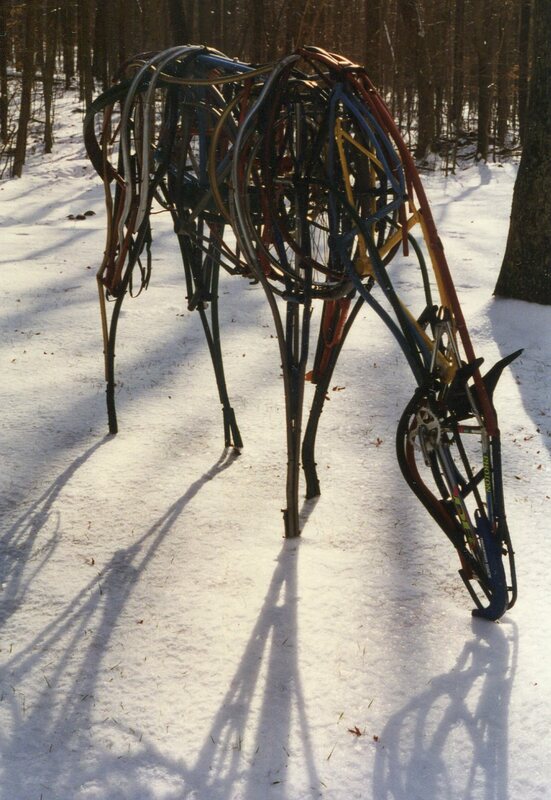 My sculpture "Grazing Horse, Resting Hiker" is installed along the Heritage Rail Trail Park at the historic Hanover Junction Station in York County, Pennsylvania. Part of the station's history included Abraham Lincoln's stay there on his way to Gettysburg to deliver his famous address. Months before, following the battle, wounded soldiers were transported through the junction to distant hospitals. Today, the restored station building is the hub of community activities, a museum and provides access to the trail paralleling the tracks. Many volunteers and interested members of the community worked hard to make the Rail Trail a reality and the sculpture was meant to commemorate their efforts and to reflect the history and current use of the trail which includes walking, jogging, running, bicycling, nature and history study, horseback riding and skiing. 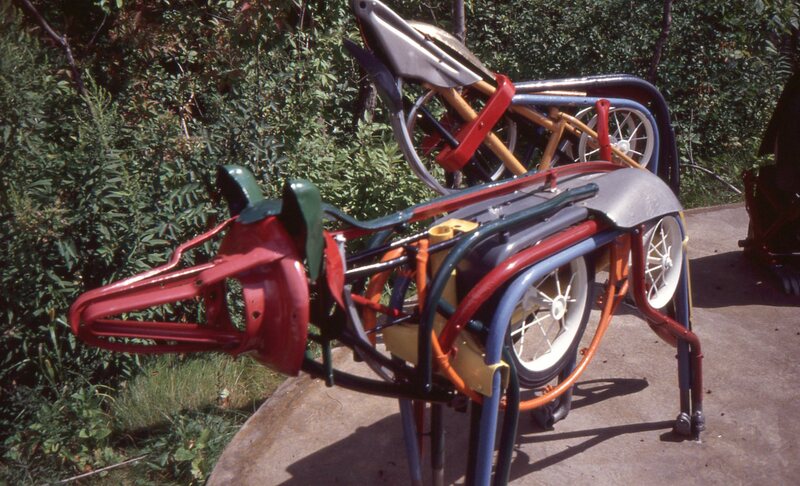 The sculpture is created out of a lot of repurposed materials related to these activities, including bicycles, tricycles, sleds and skis. "Grazing Horse" sculpture created out of various castoff materials under construction. The sculpture was ultimately installed at the Hanover Junction Station of the Heritage Rail Trail in York County, Pennsylvania. "Resting Hiker" sculpture created out of castoff materials and installed at the Hanover Junction Station of the Heritage Rail Trail in York County, Pennsylvania. Found object sculpture consisting of a lifesize grazing horse and a resting hiker installed at the Hanover Junction Station of the Heritage Rail Trail in York County, Pennsylvania. My "Family of Dolphins" sculpture consists of the figures of five dolphins that were originally created out of the flotsam and jetsam that increasingly surrounds us in our throwaway culture. The sculpture is installed at the William Donald Schaefer Promenade Fountain at the National Aquarium in Baltimore. 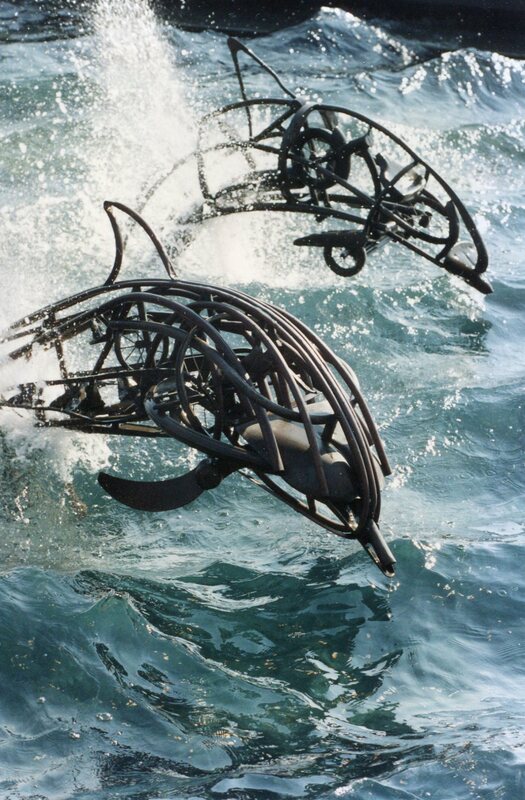 The recognizable forms of dolphins are juxtaposed with the found, repurposed, items that constitute their forms. The intent is an environmental and ecological one, consonant with the aims of the aquarium and a message of how our actions affect the health of the planet and all of the creatures living on it. "Dolphin III" is the working maquette, ultimately cast in bronze, for one of the five dolphins that constitute my "Family of Dolphins" sculpture at the William Donald Schaefer Promenade Fountain at the National Aquarium in Baltimore. "Dolphin IV" is the working maquette, later cast in bronze, for one of the five dolphins that constitute my "Family of Dolphins" sculpture for the William Donald Schaefer Promenade Fountain at the National Aquarium in Baltimore. "Dolphin IV", "Dolphin II", and "Dolphin I" bronze sculptures newly installed in the dry William Donald Schaefer Promenade Fountain at the National Aquarium in Baltimore. "Dolphin V" bronze sculpture newly installed in dry William Donald Schaefer Promenade Fountain at the National Aquarium in Baltimore. "Dolphin IV" bronze sculpture installed in the William Donald Schaefer Promenade Fountain at the National Aquarium in Baltimore, with full operation of the wave machine and waterworks. "Dolphin IV" and "Dolphin III" bronze sculptures installed in the William Donald Schaefer Promenade Fountain at the National Aquarium in Baltimore with wave machine and water effects in full operation. "Family of Dolphins" in the William Donald Schaefer Promenade Fountain at the National Aquarium in Baltimore with wave machine and water effects in full operation. 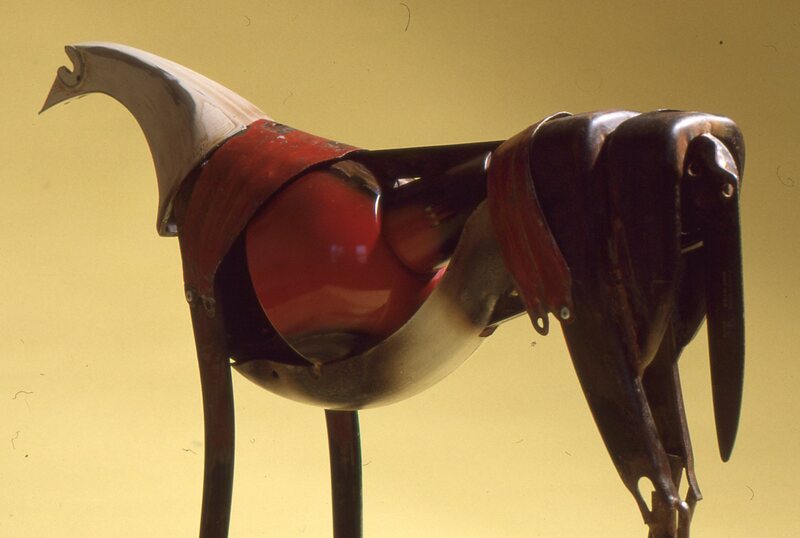 Horses have been a primary motif for the last several years. One reason that I make horses is that I find them to be beautiful creatures. As in all the animal sculptures I create, I find it challenging to capture their organic form using different inorganic objects. 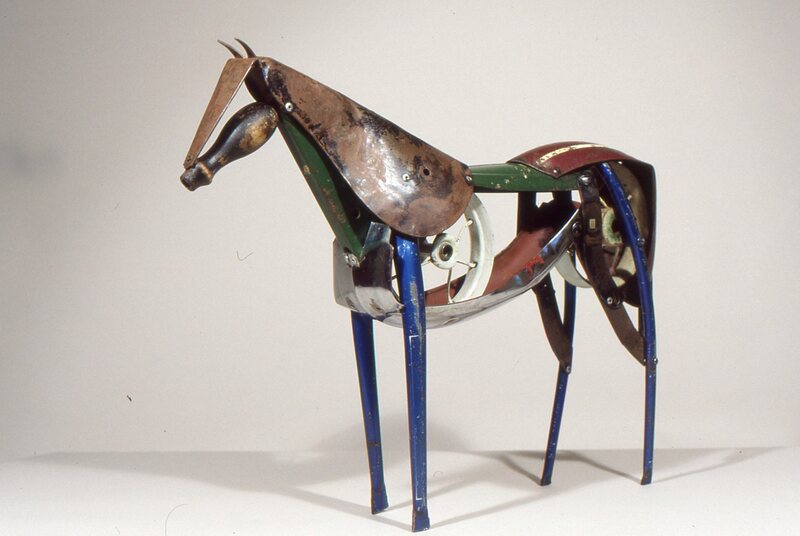 I call my sculptures of horses "Hybrids" to indicate the diverse sources of their lines. I have been attracted to bicycles and tricycles for their structure and imagined parallels with organic form. Found object sculpture incorporating various metal parts including a tool handle, bicycle and tricycle parts. 1997; 16x26x5 inches. Private Collection, Baltimore, Maryland. Found object sculpture made from various parts of bikes and trikes. 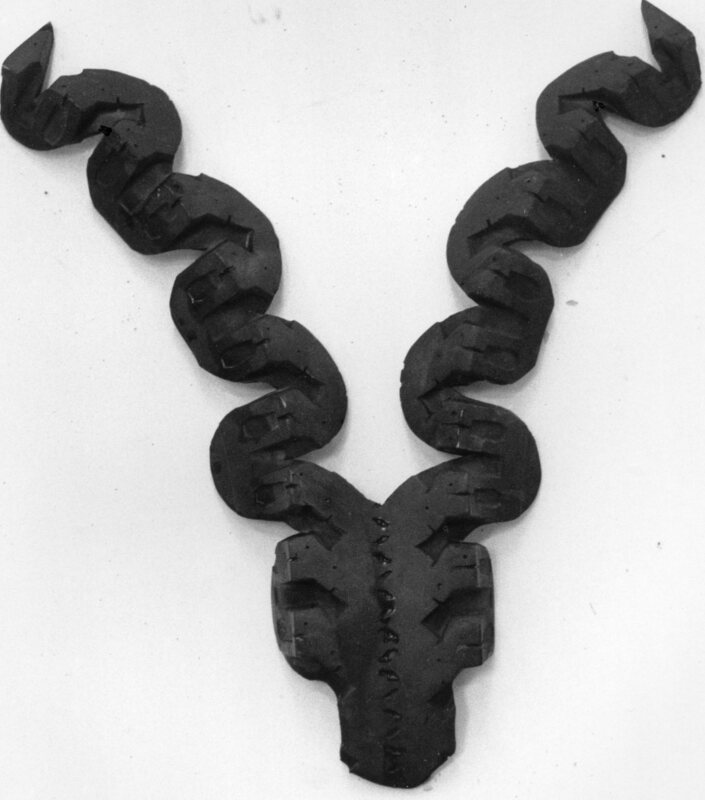 1995; 15.5x20.5x4.25 inches. Private Collection, Upperco, Maryland. 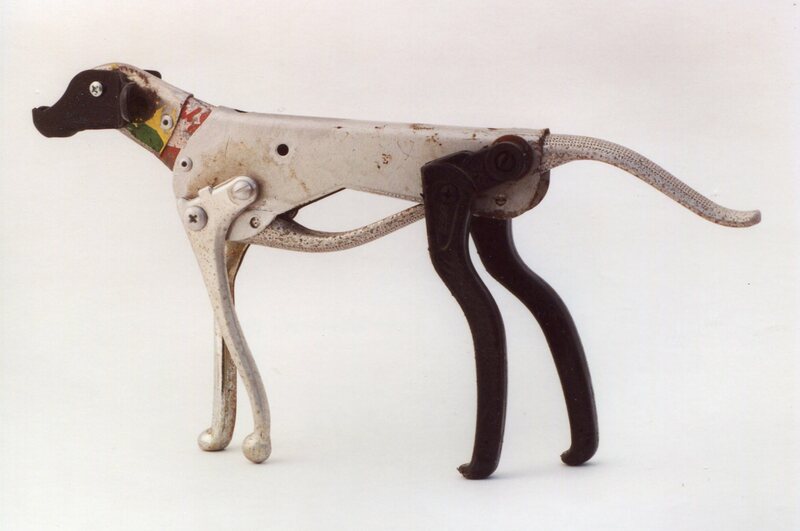 Found object sculpture using a duckpin, tricycle forks, saw and mixer base. 1993; 14x15x4 inches. Private Collection, Baltimore, Maryland. 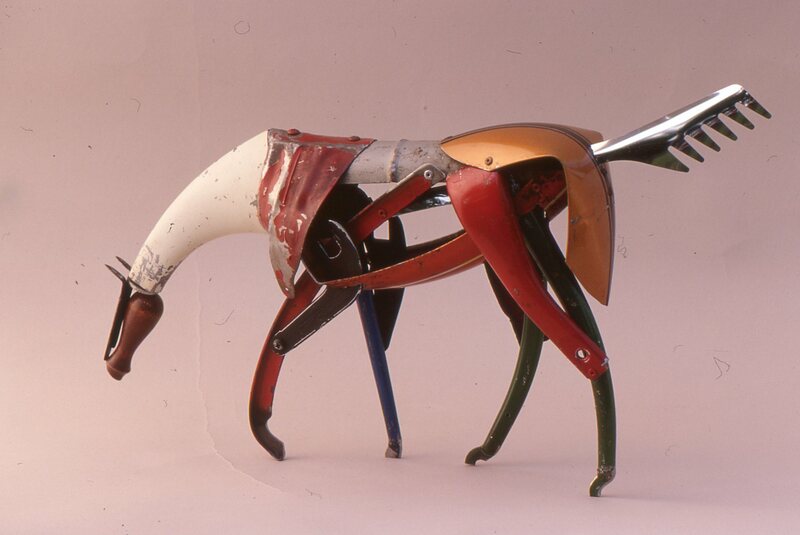 Sculpture created out of found materials.Private Collection, Upperco, Maryland. Found object sculpture using various metal fragments including a can, a bicycle fender, a drill body and a house number. 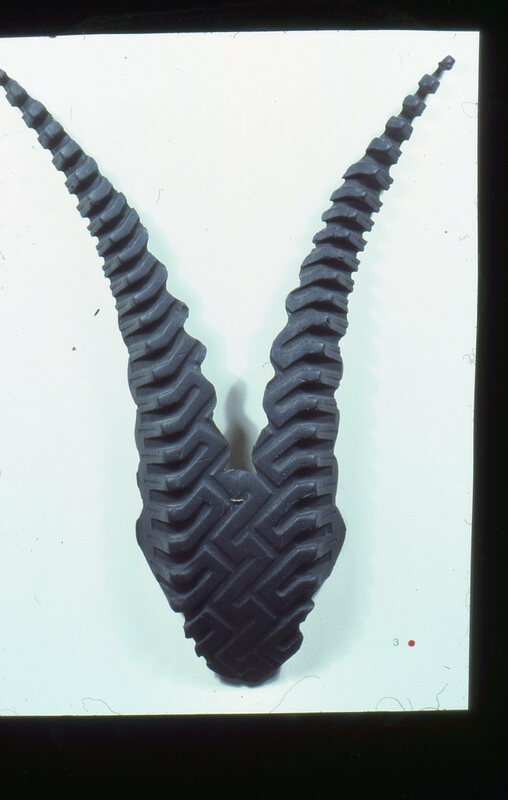 1993; 11.5x17x5 inches. Private Collection, Baltimore, Maryland. Found object sculpture creatd out of various metal parts including a horse shoe, hinges, and bicycles. 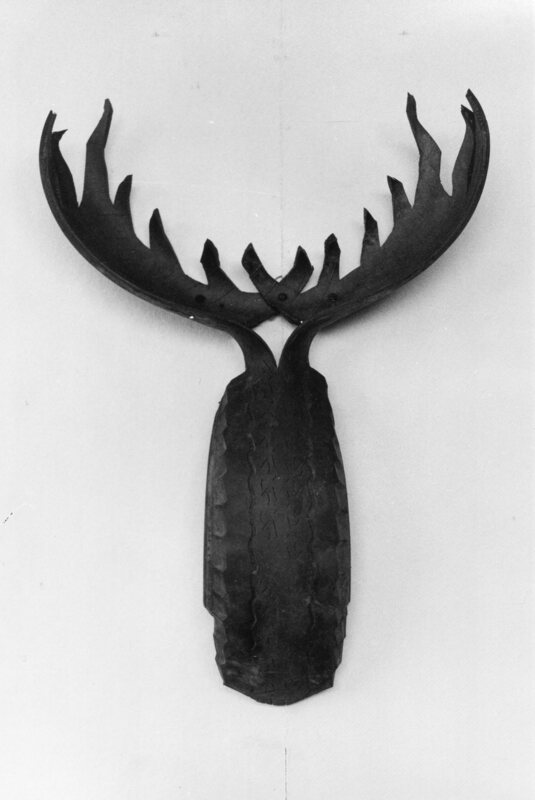 1997; 13.5x27x6 inches. Private Collection, Goshen, Kentucky. Found object sculpture incorporating parts of a metal lamp shade, a mixer base, and tricycle. 1994; 16x21x5 inches. Private Collection, New York, New York. 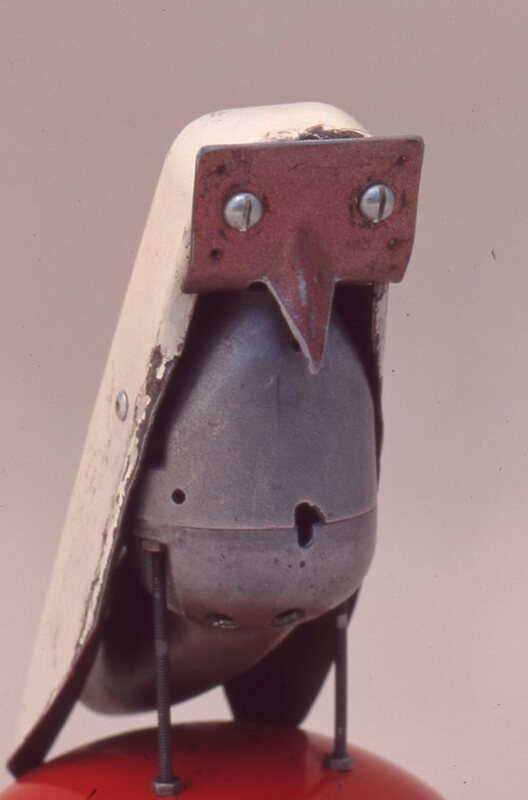 Found object sculpture created out of various metal and wood parts. 2007; 19x35x6 inches. Private Collection, Baltimore, Maryland. 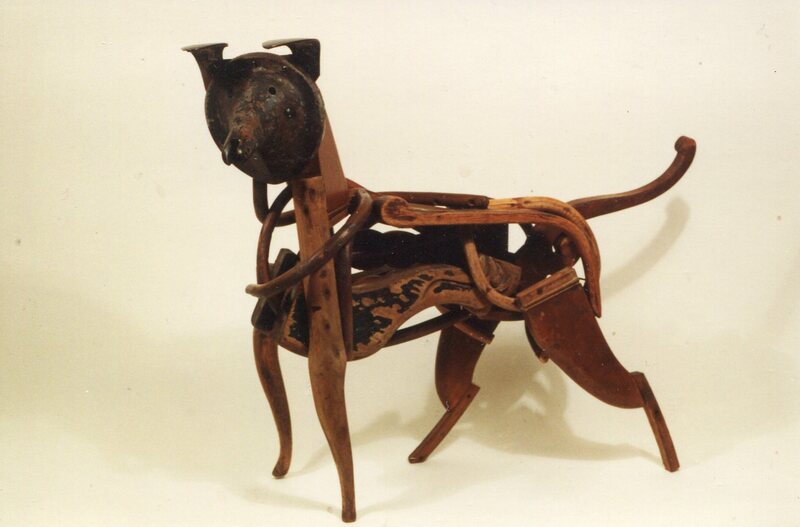 Sculpture created out of found materials. Many of these fish sculptures were created for a collaborative exhibition "Synergy" (April 6 to May 22, 2015) conceived by curator Christopher Beer and installed at the Johns Hopkins University Eisenhower Gallery. Beer's intent was to bring together four artists, along with students, activists and community to explore local environmental challenges related to consumer waste and fresh water in Baltimore. 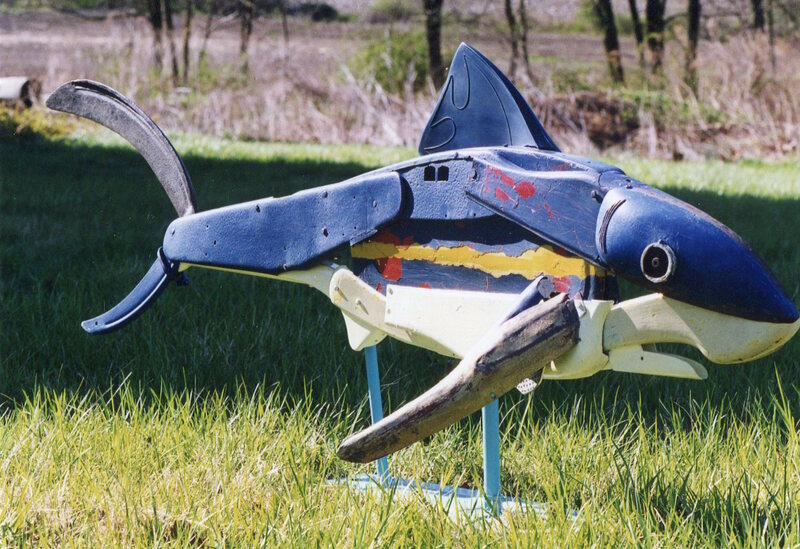 My contribution consisted of ten fish sculptures created out of the flotsam and jetsam found in the trash heaps of Maryland, and symbolizing the imaginative transformation of waste. A Small Fish sculpture created in 2016, measuring 12x24x4 inches. Materials includes portions of a metal chair, fan, kitchen implements, a sled, a hinge, a metal dish and a lamp shade. 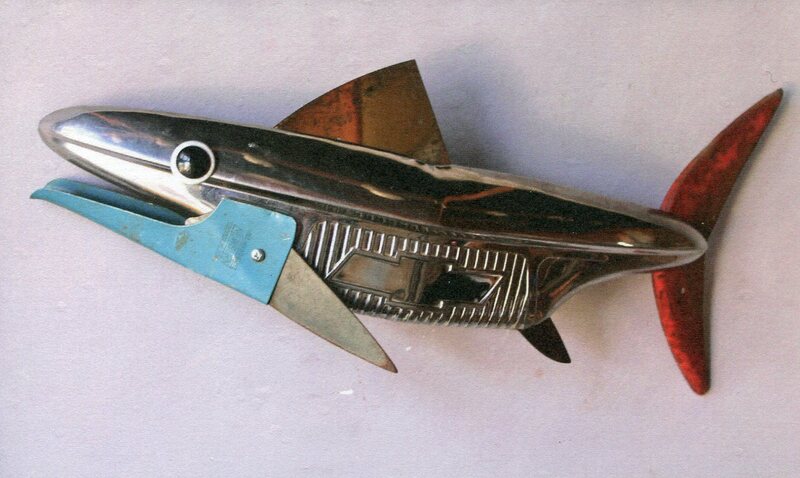 A found object sculpture of a fish titled "Greenback", made in 2016 and measuring 11x29x3 inches. 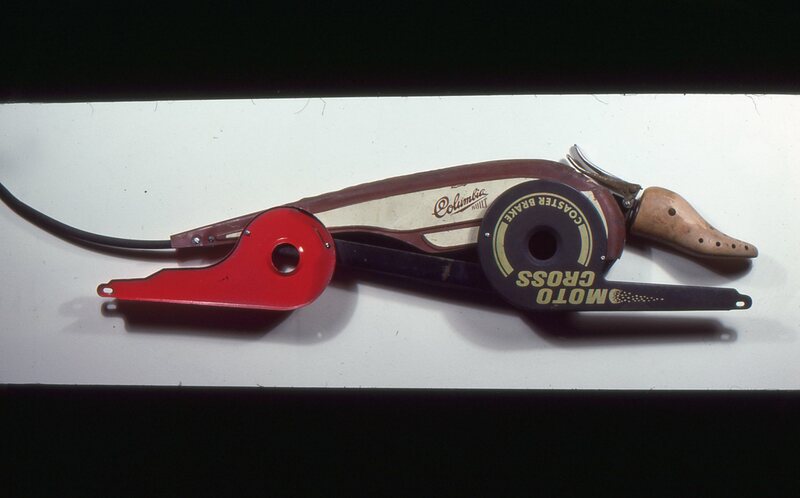 Materials include parts of a bicycle, sled, metal chair, trowel, fanblade, garden shears and a putty knife. A found object sculpture made out of a toy plane, a metal chair, a bicycle, a swimming flipper and a pulley wheel. 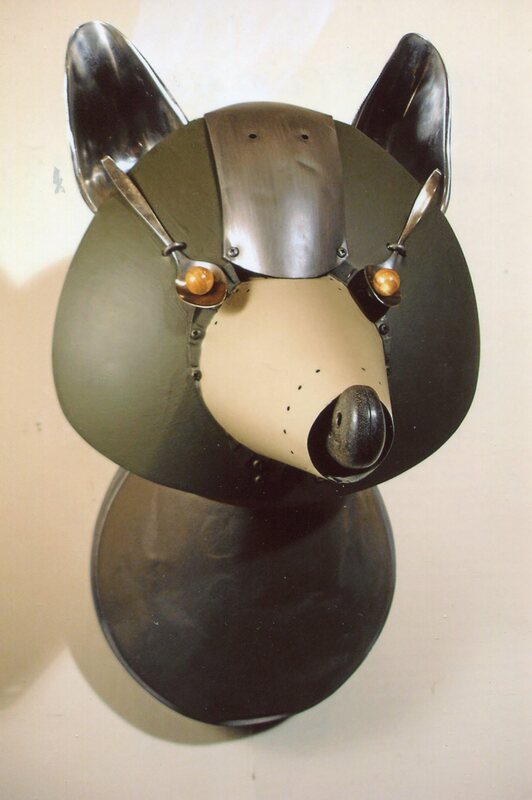 1999; 28x74x16 inches. Private Collection, Baltimore, Maryland. 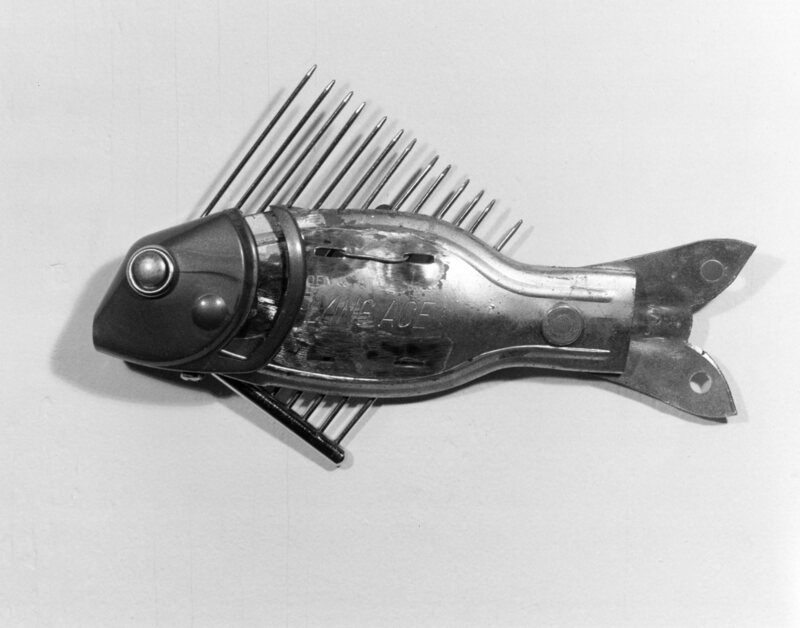 A found object sculpture made out of a skate, a comb, and various fragments. 2001; 5x8x1.5 inches. Private Collection, Baltimore, Maryland. 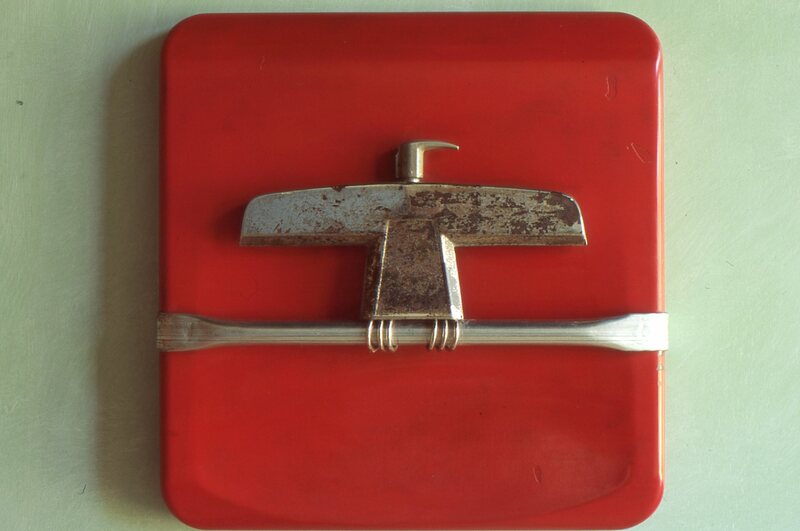 A found object sculpture created out of a Chevrolet truck hood ornament, a caulk gun, a putty knife and a grass clipper blade. 2015; 9x21x5 inches. Private Collection, Monkton, Maryland. Various sculptures of canines (dog, fox, wolf, bear) created between 1990 and 2016 that were included in shows at the Ward Center for the Arts, St. Paul's School, Brooklandville, Maryland; Maryland Art Place, Baltimore; the Galerie Francoise et ses Freres, Baltimore; Paper Rock Scissors Gallery, Baltimore; the Lancaster Museum of Art, Pennsylvania; and the Perspectives Gallery, Ellicott City, Maryland. 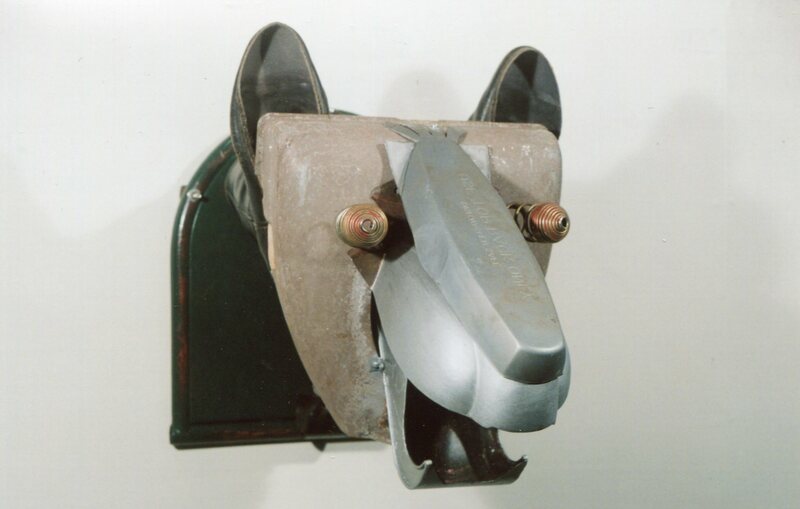 Found object sculpture of a dog's head created in 2016 and measuring 10x10x9 inches. It consists of a fan base and a pair of shoe soles. Found object sculpture created out of various metal parts. 2008; 22.5x13x21.5 inches. Private Collection, Glyndon, Maryland. Found object sculpture made primarily out of bicycle and tricycle seat frames. 2004; 10x10x12 inches. Private Collection, Cockeysville, Maryland. Found object sculpture created from parts of wood chairs, the base of a fan and the soles of shoes. 1991; 31x36x14 inches. Private Collection, Baltimore, Maryland. Found object sculpture made out of parts of bicycles, scooter and Christmas tree stand. 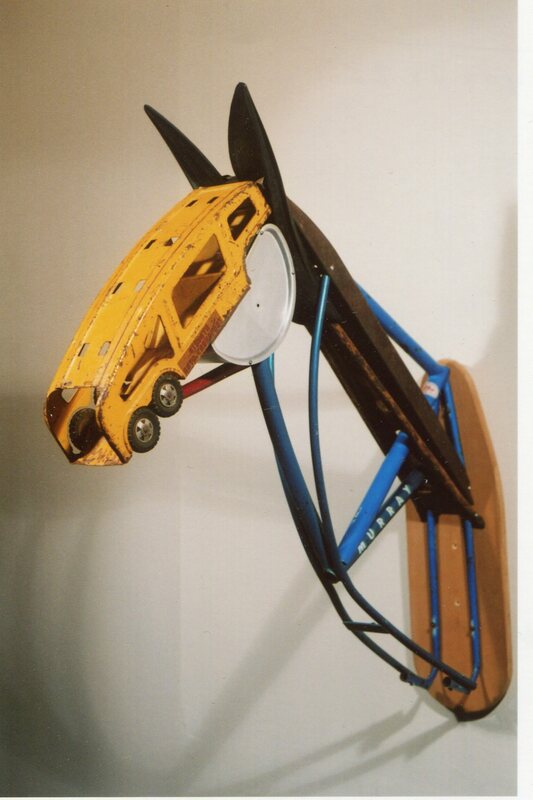 1998; 27x57x9 inches. Private Collection, Upperco, Maryland. Found object sculpture. 2003; 21x10x10 inches. Private Collection, New York, New York. 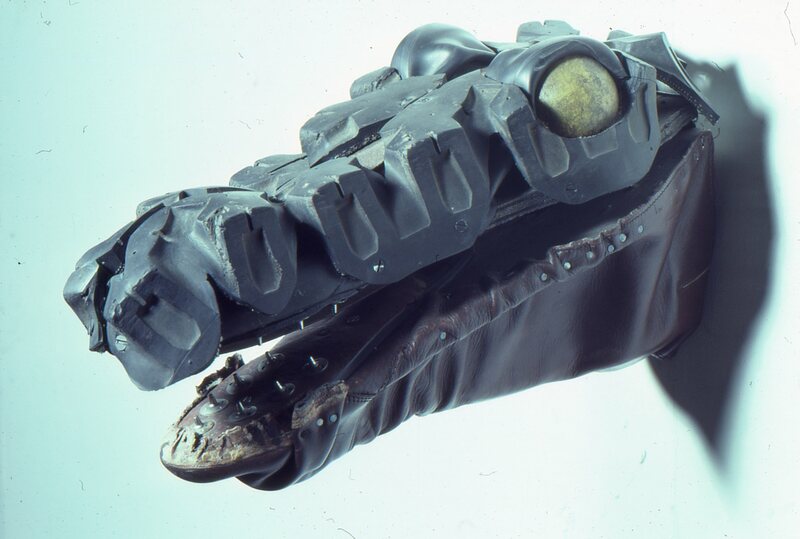 Found object sculpture created out of three bicycle chain guards, brake levers and a shoe insert. 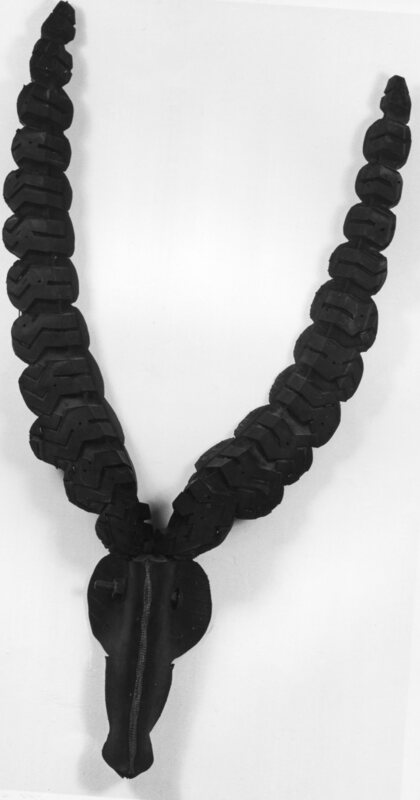 1988; 10x46x3 inches. Private Collection, New York, New York. My sculptures are born out of the creative stimulus provided by all the mass-produced castaway stuff that increasingly takes up space in our environment. The sculptures thus symbolize a solution to this waste through creative transformation. But apart from this kind of message, I create the work out of a belief that imagination is the most important facet of art-making and the discarded object is a ready-made fuel for the creative juices. Although the object may no longer fulfill the utilitarian use it was originally designed for, it still retains a color, a shape and a texture, and these qualities are the elements all artists work with. 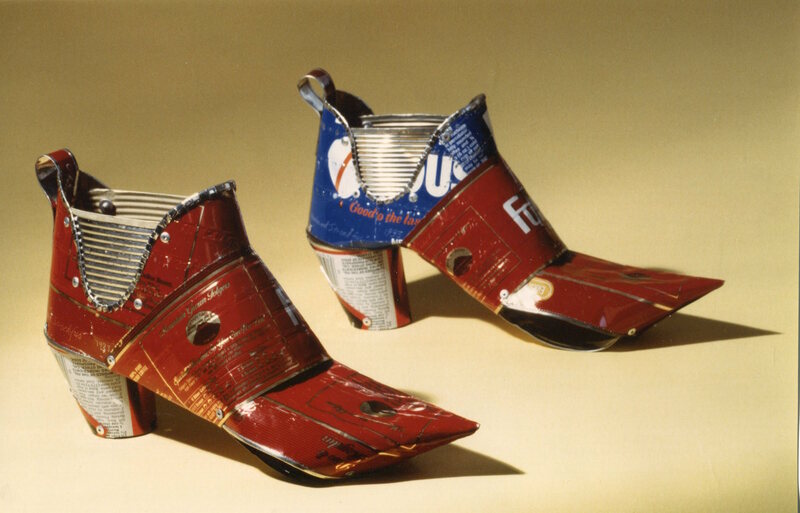 A sculpture of a pair of boots created out of various tin cans using found color and messaging. Private Collection, Baltimore, Maryland. A found object sculpture using cut and formed pieces of tin cans riveted together on a wood base shaped like the map of Italy. 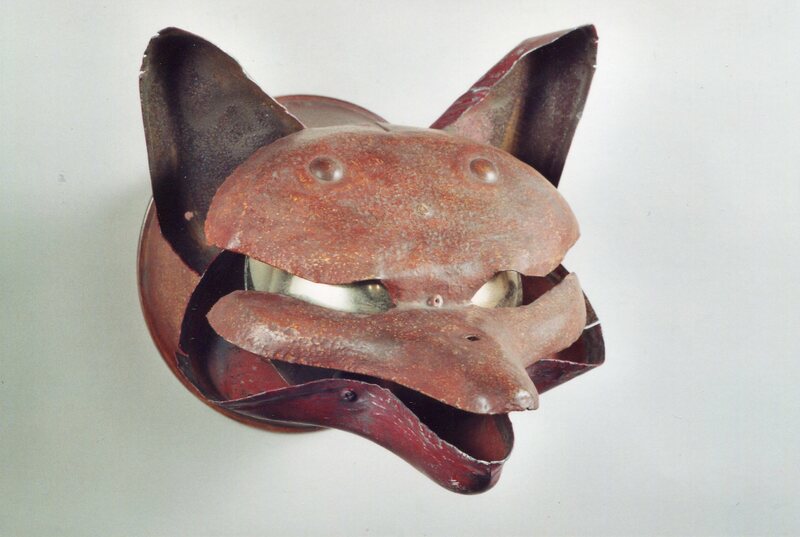 1993; 28x15x7 inches. Private Collection, Baltimore, Maryland. 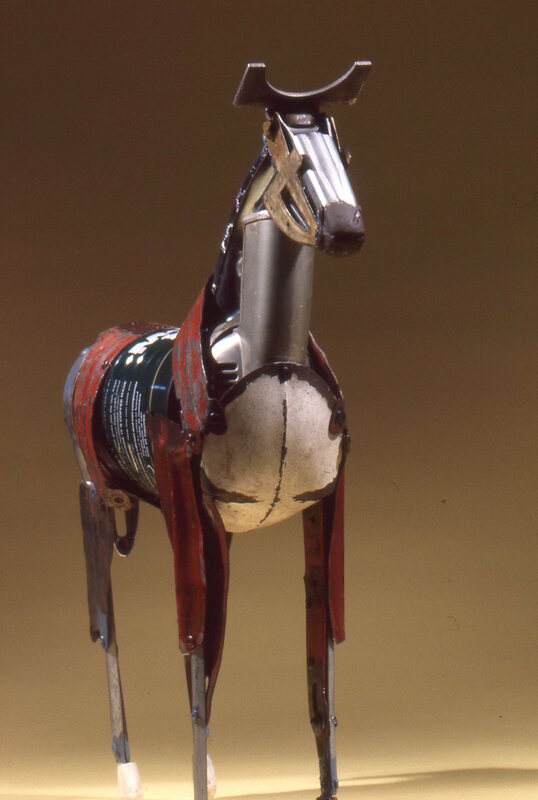 Found object sculpture created out of cut and shaped tin cans riveted together. 1993; 7x13x5 inches (each). Private Collection, Baltimore, Maryland. 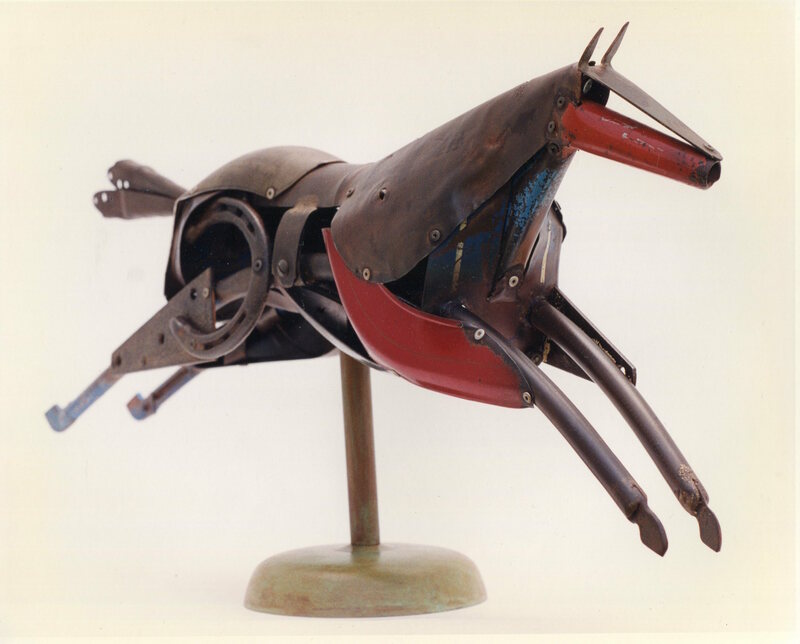 Found object sculpture created out of various tin cans mounted on a wood base. 1986. Private Collection, Washington, DC. 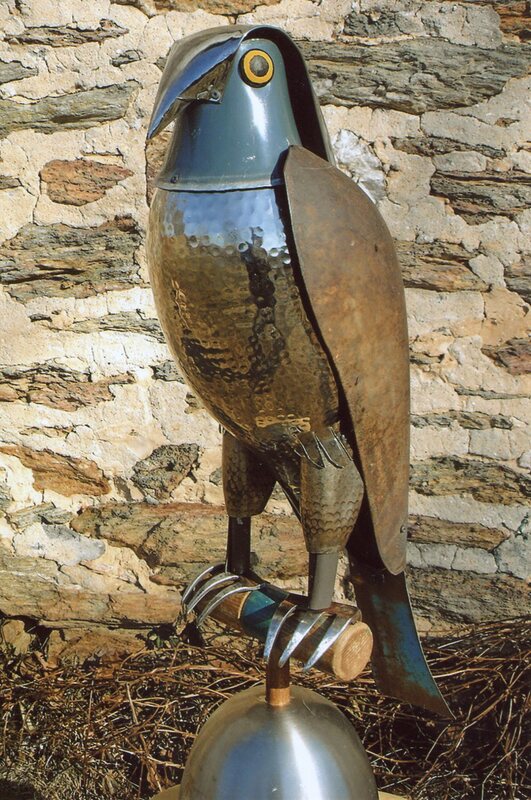 Found object sculpture created out of tin cans and sheet tin riveted together. 1982. Private Collection, Laurel, Maryland. 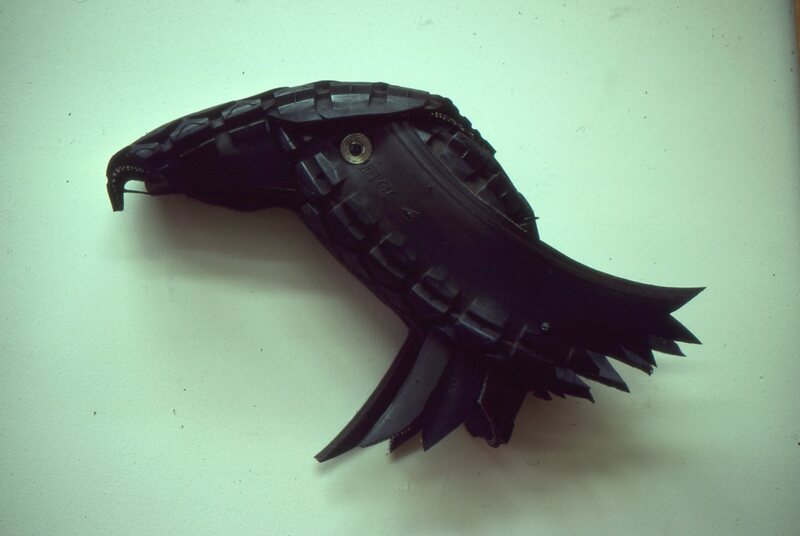 Worn out tires are a difficult waste product that resist easy recycling. But as an artist I find in their shapes and materiality an excellent stimulus to my visual imagination. I have incorporated their shapes, size and tread designs into various creatures, including moose, antelopes, crocadiles, hippos and eagles. 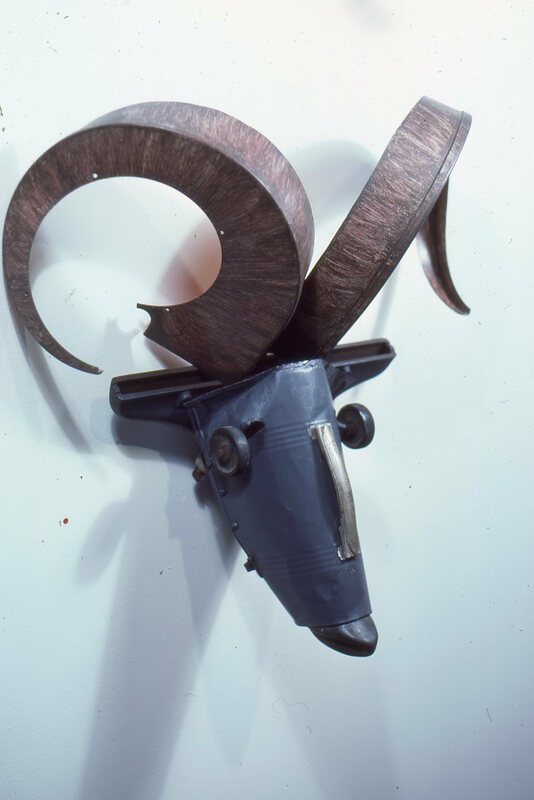 The antelope sculptures particularly remind me of the carved ebony wood sculptures of Africa and I feel a kindred creative process in using and transforming items found in my immediate environment. Carved and shaped tire. 1980; 54x48x8 inches. Private Collection, New York, New York. Carved and shaped tire. 1982. Private Collection, Philadelphia, Pennsylvania. Carved and shaped tire on a wood base. 1981. Private Collection, Marion Center, Pennsylvania. Carved and Shaped Tire. 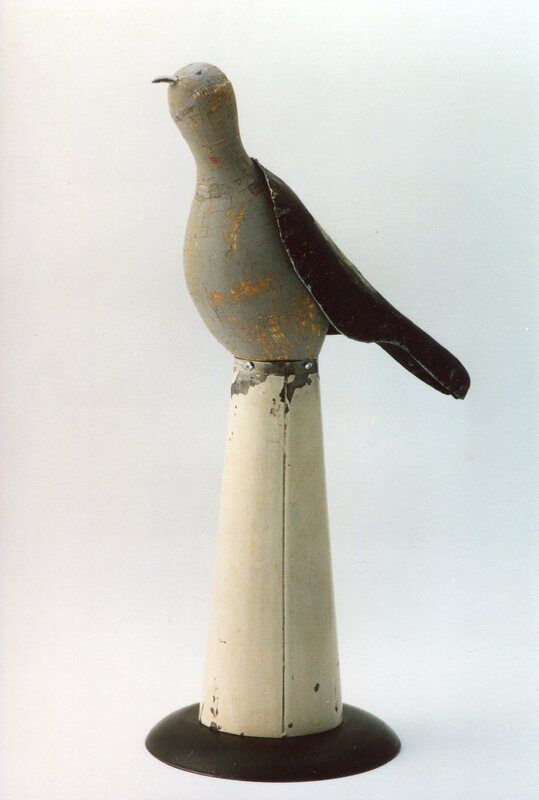 1981; 20x14x2 inches. Private Collection, Bartlesville, Oklahoma. Carved and shaped tire. 1980. Private Collection, Baltimore, Maryland. Carved and shaped tire, croquet balls, golf shoe sole, boot upper. 1981; 10x9x20 inches. Private Collection, Baltimore, Maryland. 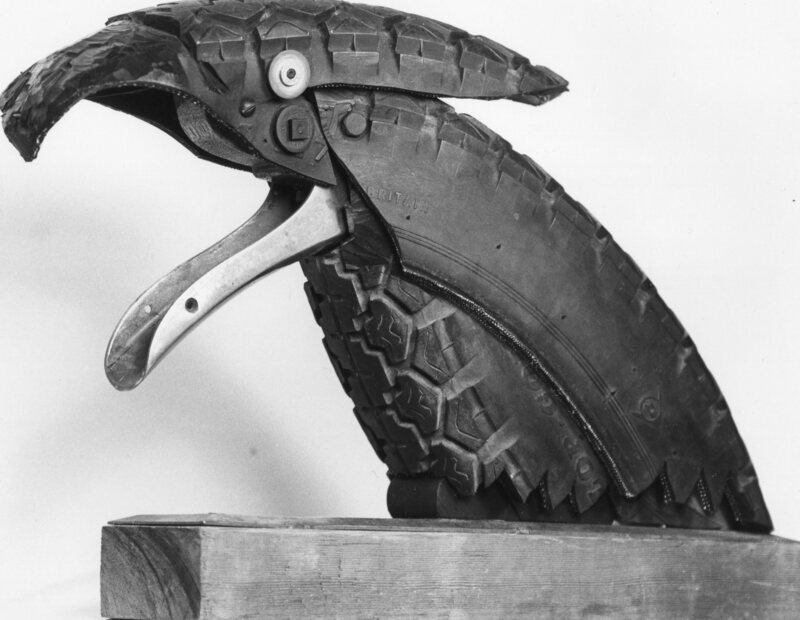 Various parts including a carved and shaped tire for the inside of the mouth, tricycle seats, beer keg, firehose and wheels. 1986; 29x22x35 inches. Private Collection, Monkton, Maryland. 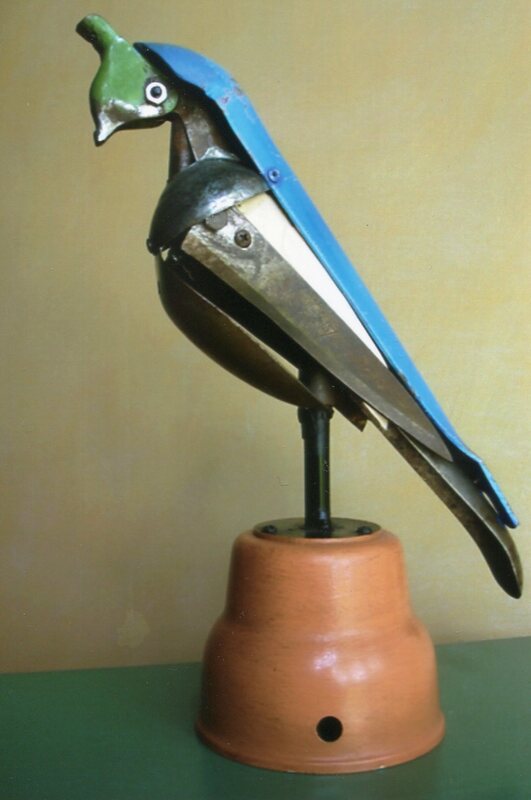 These bird sculptures were created between 2002 and 2015 for shows at the Galleria Solaria Arte in Piacenza, Italy; Paper Rock Scissors Gallery, Baltimore; the Galerie Francoise et ses Freres, Baltimore; the Steven Scott Gallery, Baltimore; the Smithsonian Craft Show, Washington, DC; and the Italian Cultural Center, New York, New York. 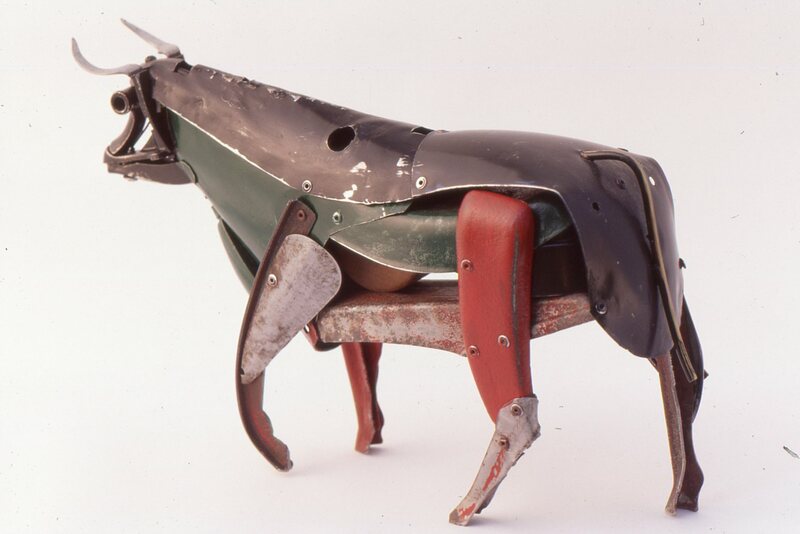 A found object sculpture created out of fragments of various metal items including a chair seat, a tube, and a door handle. 2007. Private Collection, Baltimore, Maryland. 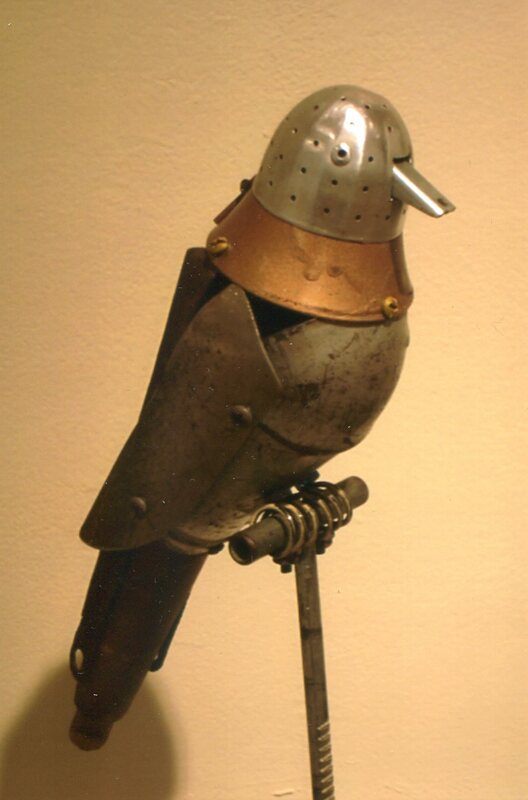 A found object sculpture created out of a variety of fragments of metal objects. 2005; 12x7x4 inches. Private Collection, New York, New York. A found object sculpture created out of a teaball, and assorted fragments of metal items. 2005; 21x8x7 inches. Private Collection, Glyndon, Maryland. A found object sculpture created out of a garden hoe and an old portable heater housing. 2003; 12x10x7 inches. Private Collection, Milan, Italy. A found object sculpture created out of a metal chair arm, a tricycle, and a drill. 2002; 9x5x5 inches. Private Collection, Milan, Italy. A found object sculpture created out of a watering can, shovel and tricycle. 2005; 19x15x6 inches. Private Collection, Milan, Italy. A found object sculpture created from a rake, a bicycle light and a metal lamp shade. 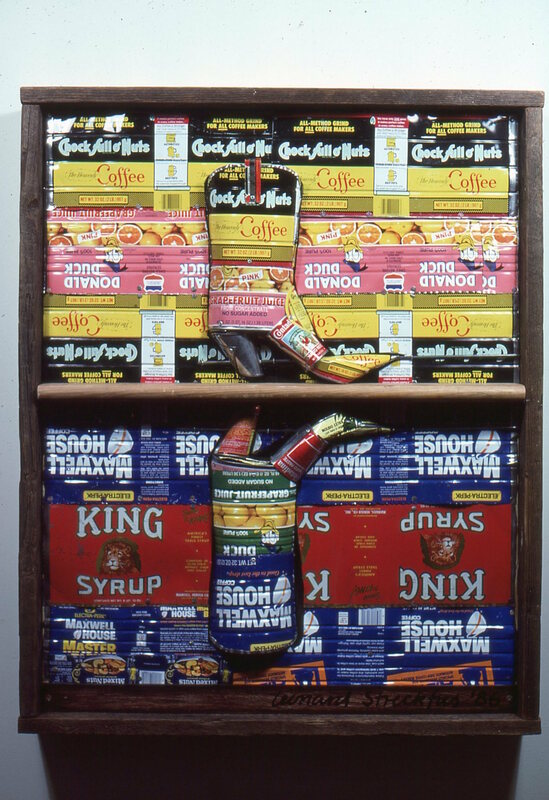 1991; 61x12x10.5 inches; Private Collection, Baltimore, Maryland. 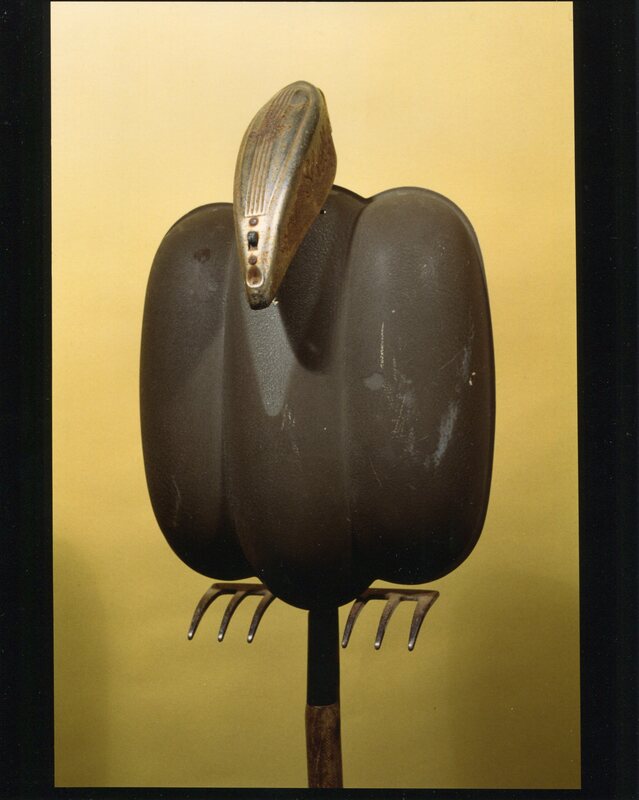 A found object sculpture created out of a duckpin, a bike seat and a metal cone. 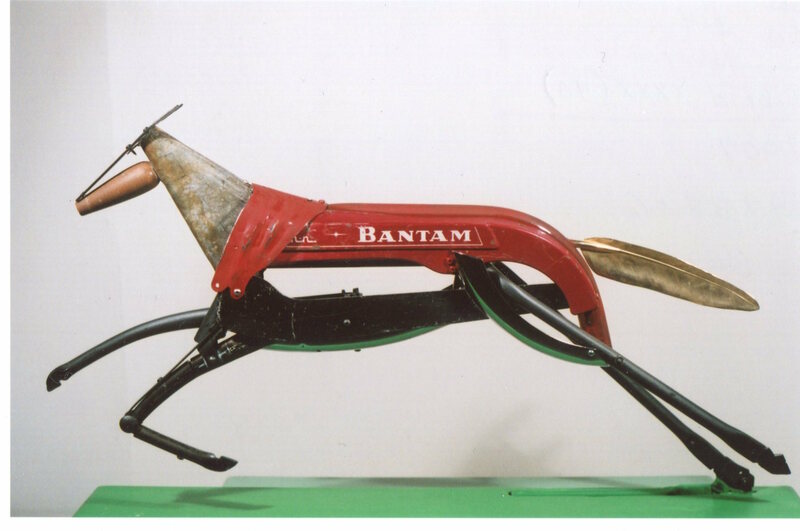 2005; 20x10x7.5 inches; Private Collection. 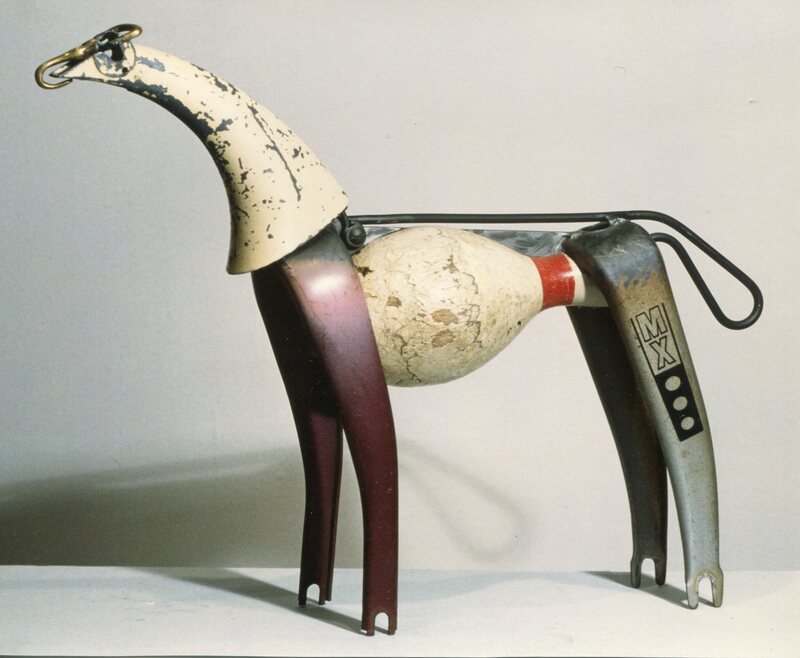 Various sculptures created between 1986 and 2016 that were included in shows at the B R Kornblatt Gallery, Washington, DC; the Maryland Institute, College of Art, Baltimore; the Fuller Craft Museum in Brockton, Massachusetts; Maryland Art Place, Baltimore; Art for Land's Sake exhibition of the Valleys Planning Council, Baltimore County; and the Y-Art Gallery, Baltimore. Found object sculpture created from fragments of a sled, tricycle, skate and shoehorn. 2008; 23.5x38.5x21.5 inches. Private Collection, Columbia, Maryland. 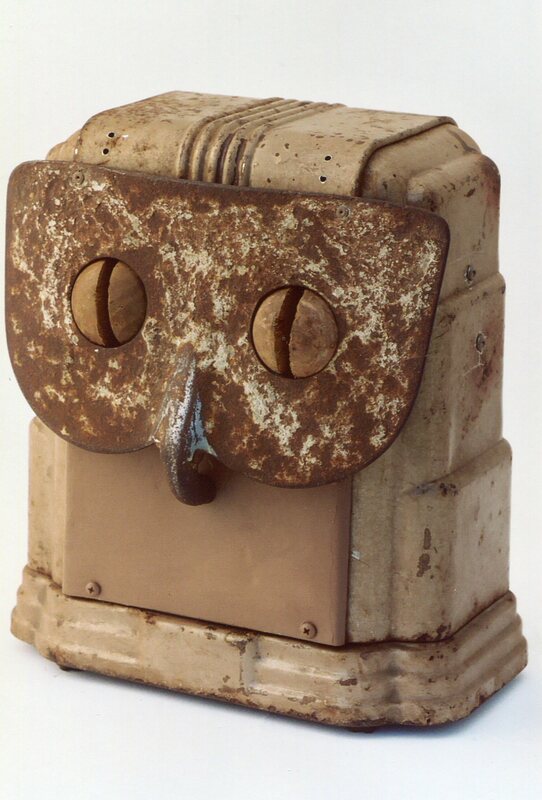 Found object sculpture created from a lunch box, vacuum cleaner and fan housing. 1986; 24x22x9 inches. Private Collection, Arlington, Virginia. 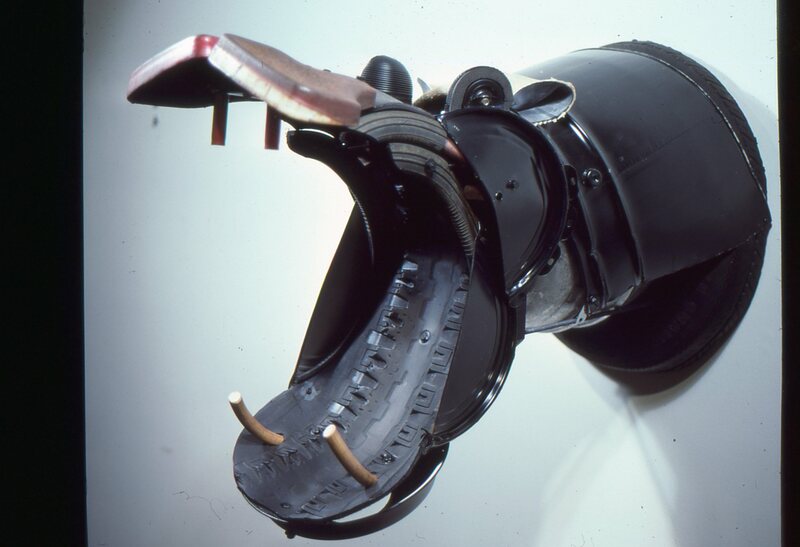 Found object sculpture created out of fragments of a vacuum cleaner, boots, bicycle seat and metal chair seat. 2007; 20x15x25 inches. Private Collection, Baltimore, Maryland. Found object sculpture. 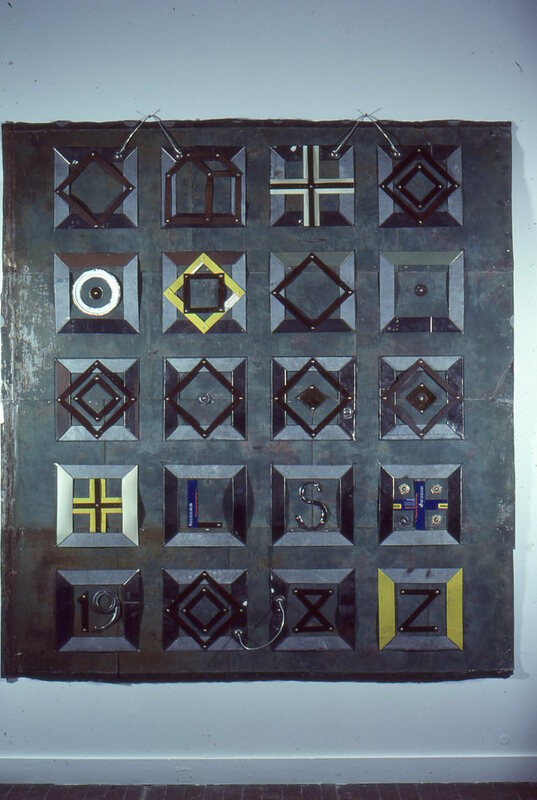 1996; 70x110x28 inches. Private Collection, Baltimore, Maryland. Found object sculpture titled "Dolphin Head" created in 2016 and measuring 11x8x11 inches. Materials include parts of a toy tractor, bicycle, metal chair and Christmas tree stand. Private Collection, Baltimore, Maryland.